The only tape of speeches by Martin Luther King, Jr. at Arizona State University were unknowingly purchased at a Goodwill resale. Mary Scanlon had no idea a $3 purchase from a Goodwill resale store in Phoenix would turn out to be a rare link to the civil rights movement's most revered leader. Last April, Scanlon was at the thrift store when she spotted a pile of 35 vintage reel-to-reel tapes, including one labeled with the Rev. Martin Luther King Jr.'s name. Despite the moldy and torn packaging, she snapped up all of them. "I didn't really necessarily have any expectation that this tape would be rare," Scanlon said. Arizona State University archivists have found that tape is the only known recording of speeches the slain civil rights leader gave at the school and at a Phoenix church in June 1964. The hour-long audio has since been digitized and is now available for listening on ASU's website through June 30. Scanlon, who donated all the tapes to the school, said the find is one of the high points of her life. "To have anything about myself connected in any way to Martin Luther King, what more could a person ask for? I'm so proud," Scanlon said. Rob Spindler, a university archivist and curator, said it's miraculous that the audio was still intact. When he first spoke with Scanlon, he immediately warned her not to try and play the tape. "When the material is that old, sometimes you only get one shot to preserve it," Spindler said. Arizona was the last stop on a West Coast tour King had been doing, Spindler said. The university and the local chapter of the National Association for the Advancement of Colored People worked to get the preacher to come. About 8,000 people attended the June 3 speech at Goodwin Stadium that started about 8 p.m. 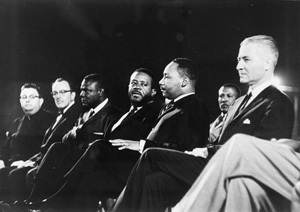 In his remarks, King focused on the Civil Rights Act, which at the time was stuck in a filibuster in the U.S. Senate. Keith Miller, an ASU English professor who has written two books on King, said King's visit affirmed the importance of Arizona's African-American community. While African Americans made up about 2 to 3 percent of the state population, there was an active group in Phoenix that conducted sit-ins and protests, Miller said. In 1987, then-Gov. Evan Mecham rescinded Martin Luther King Jr. Day as a holiday. The fallout, which included losing a bid to host the Super Bowl, damaged Arizona's image. In 1992, an initiative to restore the Martin Luther King Jr. Day in Arizona was approved, making it the first state with a voter-approved King holiday. More recently, the ASU chapter of the Tau Kappa Epsilon fraternity had its recognition permanently revoked this month after several members attended a Martin Luther King Jr. Day party that was deemed distasteful. The party allegedly perpetuated racist stereotypes with offensive costumes. The scandal came out the same week the recording's availability was announced. "It was really disappointing that terrible event overshadowed this great history, at least for moment," Spindler said. "Somebody posted on Facebook they should make those kids listen to the recording and write an essay about it. I think that's a good idea." Follow Terry Tang on Twitter.